Sharsheret, Hebrew for “chain”, is a national not-for-profit organization supporting young women and their families, of all Jewish backgrounds, facing breast cancer. Its mission is to offer a community of support to women diagnosed with breast cancer or at increased genetic risk, by fostering culturally-relevant individualized connections with networks of peers, health professionals, and related resources. To learn more visit Sharsheret’s website. Sharsheret leads the national Jewish response to breast cancer and ovarian cancer by working with local community partners, to create and enhance culturally-relevant local breast cancer programs, support services, resources, and events. Raleigh-Cary Jewish Family Services became a Shrarsheret partner in June 2016 and has been working to increase awareness and provide support to women and families in our community. Raleigh-Cary JFS is proud to have been named as one of only eleven national Sharsheret Partners of Excellence. This designation recognizes our efforts in behalf of Jewish Women and their families facing breast cancer. Partners of Excellence receive special program support and grant funding from Sharsheret. We are excited about being included in this exclusive national group of dedicated social service agencies. During Ovarian/Breast Cancer Awareness Months, JFS holds a “Busy Box” collection for Sharsheret. Sharsheret’s Busy Box provides resources to help parents guide young children through their mother’s cancer journey and address the needs of their children during the diagnosis, treatment, and beyond. The Busy Box, which is free of charge and mailed directly to the family’s home, includes age and gender appropriate games and activities to occupy children during doctor appointments or while mom is resting after treatment. 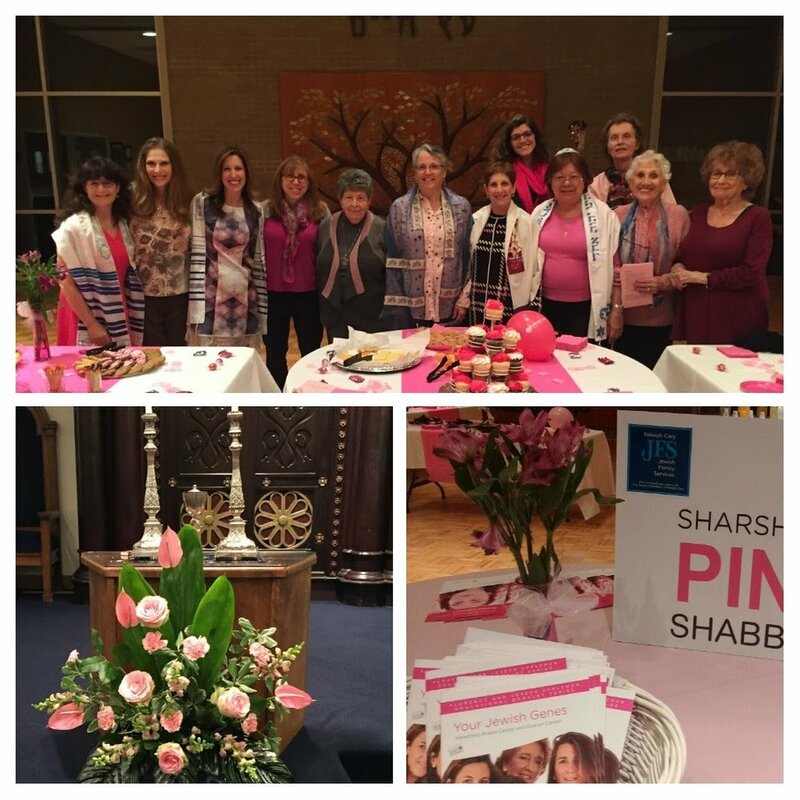 Sharsheret Pink Shabbat is designed to educate women and men about the increased risk of hereditary breast cancer among Jewish families, the impact of breast cancer on the Jewish community, and Sharsheret’s breast cancer programs for Jewish women and families of all backgrounds. In 2017 & 2018 events were held in congregations, youth groups, college organizations and more; hundreds of community members attended events, listened to courageous speakers, and helped increase awareness to breast cancer in the Jewish community!